Medium - $46.99 Large - $46.99 Only 3 left! What would your kiddo if he could have a day as a flying monkey? As much as you would try, he'd probably get out of the house. And you could forget about telling him to stick to flying on your side of the block like when he got his trike. With wings, the whole city would belong to your little monkey. When planning your kid's first day of flight you've got to remember that he doesn't just have wings, your kid is also a monkey now. So you might want to take him to a city park. We know, why wouldn't you bring him to the forest? Well, at a city park he can simply climb to the top of a pine tree and take off from there, sailing for the birch twenty feet away. Maybe he'll even rescue that kite that's been stuck in an elm for six months. It would also be interesting to check out the zoo, maybe he'll be able to translate for the Capuchins, you two can finally figure out what those little guys are chattering about. Your kid probably has a few ideas of his own about what he'd do as a winged monkey, all of which are a little more haphazard than our ideas. Lucky for you, there is little to no chance that anyone would wander by and make him morph. If he has flying monkey aspirations, we can help, at least with the aesthetics. 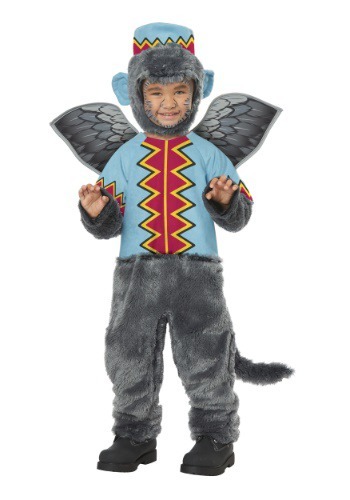 He'll love this costume with its furry body and hood, colorful clothes, and cute gray wings. Whether he's dressing up for a play or Halloween, you'd better watch out, he might be making plans for his launch date. If he gets too obsessed with flight just set him down with some bananas. That usually keeps those monkeys calm.